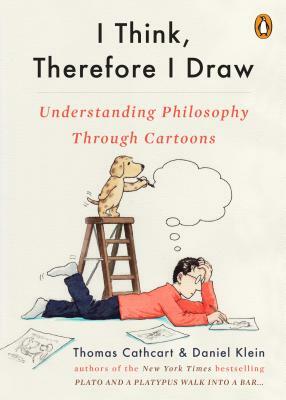 Thomas Cathcart and Daniel Klien have been thinking deep thoughts and writing jokes for decades, and now they are here to help us understand Philosophy through cartoons, and cartoons through Philosophy. Covering topics as diverse as religion, gender, knowledge, morality, and the meaning of life (or the lack thereof), I Think, Therefore I Draw gives a thorough introduction to all of the major debates in philosophy through history and the present. And since they explain with the help of a selection of some of the smartest cartoonists working today, you'll breeze through these weighty topics as you guffaw and slap your knee. Cathcart and Klein's Plato and a Platypus Walk into a Bar... and Heidegger and a Hippo Walk Through Those Pearly Gates have been a favorite of philosophers and non-philosophers alike for years. Packed with dozens of witty cartoons and loaded with profound philosophical insight, I Think, Therefore I Draw will delight readers and leave them enlightened. Danny has written comedy for Lily Tomlin, Flip Wilson, and others, and published scores of fiction and non-fiction books--from thrillers to entertaining philosophical books, such as his London Times bestseller, Travels with Epicurus, and his most recent book, Every Time I Find the Meaning of Life They Change It. Tom studied theology and managed health care organizations before linking up with Danny to write Plato and a Platypus Walk into a Bar, Aristotle and an Aardvark Go to Washington, and Heidegger and a Hippo Walk through Those Pearly Gates. He is also the author of The Trolley Problem, or Would You Throw the Fat Guy Off the Bridge? an entertaining philosophical look at a tricky ethical conundrum.